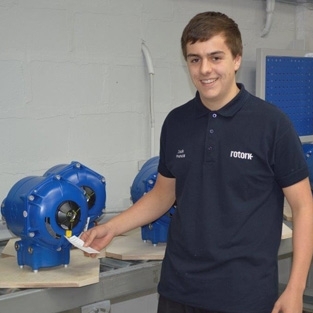 I joined Rotork in 2013 when I was 16 years old as an Advanced Apprentice after completing a Level 2 Diploma in Engineering at secondary school. I chose an apprenticeship when I decided that I wanted to get some hands on experience in the engineering field. Learning how to complete tasks in a real life working environment is one of the many perks which comes with an apprenticeship and this is one of the main reasons why I chose this route over university. with most of the Rotork employees and build relationships with them. It also gives me a good understanding of how each department operates. During my apprenticeship I will achieve a NVQ Level 3 in Engineering Technical Support, a Level 3 Engineering extended Diploma involving Mechanical and Electrical units, as well as a HNC in these same subjects and have an opportunity to go further if I continue with a full time job. Health and safety and personal learning qualifications are also gained on the way through the apprenticeship. I thoroughly enjoy working at Rotork. Regular changes to my day to day activities means each day holds something different, making the job interesting. Learning new skills is a regular occurrence and I was warmly welcomed into the company by all members of staff. On college days I spent time with the other apprentices in my year along with other people on the course. Rotork has a social club where members have the opportunity to take part in various out of work events and sporting activities. There are other events which all employees can attend, such as the annual Dinner Dance. In Rotork we also have an annual Christmas meal. This is a great opportunity to unwind with all of the other apprentices on a night out. We eat good food and enjoy a great night together! Since joining Rotork I feel I have improved on my social skills, along with becoming more confident in my own abilities. This is something I believe can only be achieved from experience in the work environment. As I am now towards the final part of my apprenticeship, it’s impossible to say which department I will like to be in when I finish, however I look forward to experiencing the remaining departments and meeting the different people in these areas.